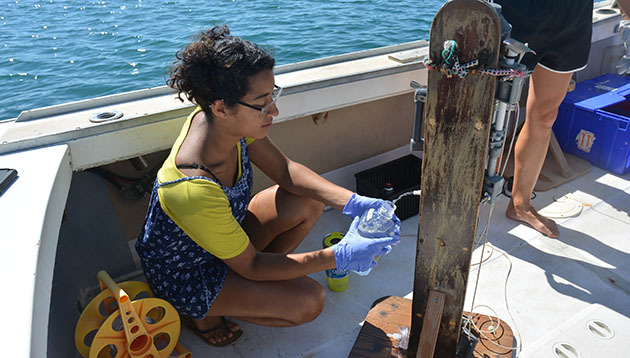 Lakshmi Magon's research project focused on marine bacterioplankton succession and overturn at Devil's Hole, in Harrington Sound, Bermuda. Specifically, she looked for inter-annual variations of specific baterioplankton lineages during periods of low oxygen. 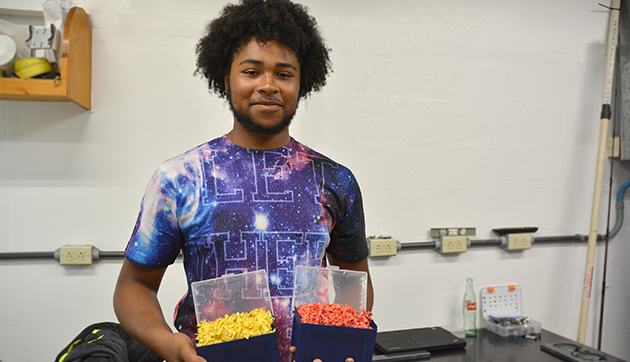 Jacari Renfroe's research project aimed at recycling beach plastics into useful items. Last year he built a small plastic injector and designed and machined some simple molds using the CNC machine. This year he continued learning how to use different CAD software to create more complex molds, as well as learning methods of sorting different plastic types by their properties. Khalil Smith (middle) worked on a large, cross-Caribbean seagrass project. 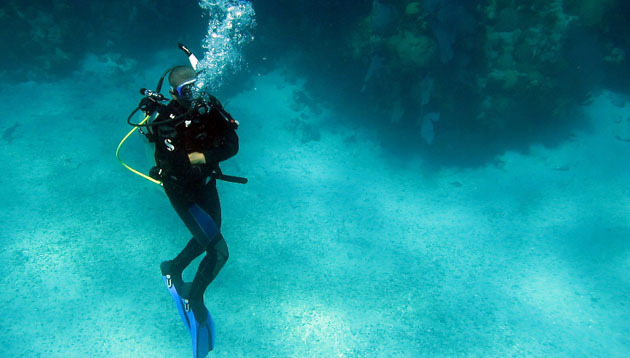 He assisted with the in-situ work in Bermuda, which included seagrass productivity measurements, a census of seagrass-associated invertebrates, grazing assays, and underwater cage maintenance. 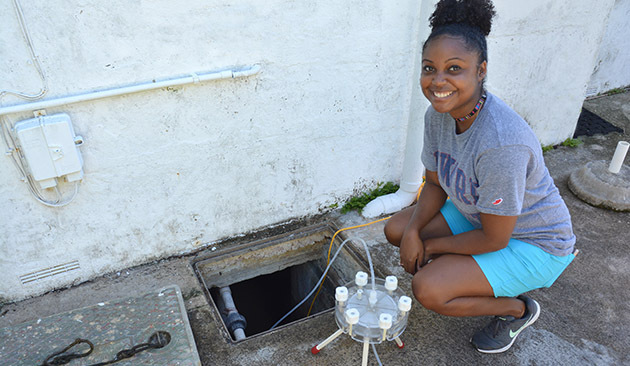 Raisa Stovell examines suspended particles in the water tanks of Bermudian homes to determine if there are any chemical contaminants present, and whether consumption of the water could pose a threat to health. Amber Reid investigating the microbial population found in Devil’s Hole, Harrington Sound, and how this population changes with the seasons. Check out our video about Ocean Academy: Bermuda's source for environmental education and a global training center for young scientists. 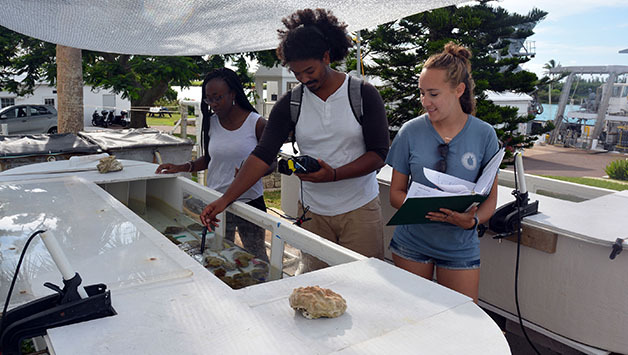 The Bermuda Program offers a unique opportunity for Bermudian students, ages 18 and older, to broaden their knowledge of marine and atmospheric sciences and learn about the daily operations of an active research station. Since 1976 more than 150 young Bermudians have taken part in this exciting program, with many applying their summer experiences toward further university studies. Beyond that, some Bermuda Program graduates have successfully translated their summer internships into employment opportunities at BIOS and other related organizations in Bermuda. 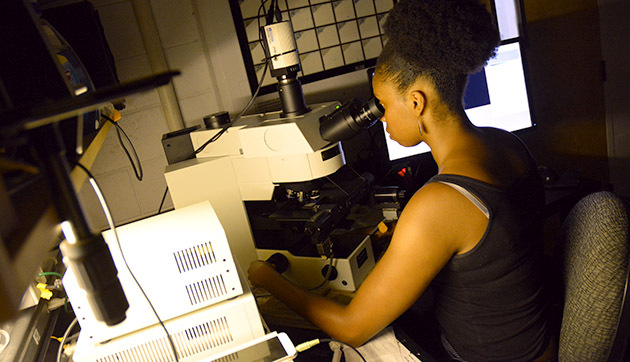 A handful of budding scientists are selected each year to receive paid fellowships (stipend plus laboratory expenses) that allow them to work on a specific project of interest alongside BIOS scientists in both field and laboratory settings. The internships are full time (Mon – Fri, 9am – 5pm) and may have occasional night and weekend work as required by the project. Internships run for 8 or 4 weeks during the summer and include opportunities for participants to present their research in a traditional academic seminar. If selected, you’ll be placed with a faculty mentor who'll work with you to set the 8-week or 4-week internship period. There are no academic prerequisites to receive this fellowship and each application is given equal weight. However, faculty tend to select students who already have considerable laboratory experience in their field, possibly through previous BIOS programs. Please note: at the request of sponsors, the Bermuda Program is only open to Bermudians and Bermuda permanent residents (PRC). Non-Bermudians interested in similar experiences are encouraged to consider BIOS Independent Research Internships. You can find the 2019 Bermuda Program application form here. Depending on which version of Adobe you are using, you may be able to download these forms (save them to your desktop), fill them out on your computer, save them, and email them to oa@bios.edu. For those with older versions of Adobe, it may be easiest to print the forms, fill them out, then scan and email them. The deadline for submitting completed applications is April 1, 2019. Shortlisted applicants will be contacted for interviews by April 30, 2019. Speak to your advisor, department head, study abroad coordinator, or internship office at your home university about setting up an independent program that will provide you with unique educational benefits. Obtain a copy of all related information from the BIOS website (e.g., course syllabus) about the program in which you will participate. Bring this information when you meet with your academic advisor, department head, or study abroad coordinator. Work with your academic advisor to ensure that your proposal meets your school's academic requirements. Upon request, BIOS will provide you with a signed certificate of completion that you may submit to your school. The certificate will identify the course or project title, the instructor or principal investigator, location, dates, and will describe the type of course material that was covered and/or the type of research you conducted as part of your internship. Submit all completed documentation to your advisor when you finish your Bermuda visit. Make sure the final documentation is filed with your department, study abroad office, or internship program. “The Bermuda Program has always supported me in my education. I have been able to continue learning laboratory techniques and also learn how to plan camps and lessons for different age groups. I appreciate being able to teach others and share my passion with them.” Phoebe Barboza, 2018. “A BIOS internship is a great experience for anyone either undecided or sure about going into scientific research. It gives you the ability to go forward as a more confident researcher and person.” Lakshmi Magon, 2018.